Uncharted 2: Among Thieves Will Get Some DLC Before The Year Is Out. Thankfully, creative director Amy Hennig reckons it "is exceeding expectations" and outselling the original by "many, many times". 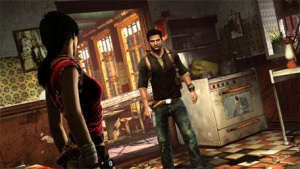 With Uncharted a more established franchise and the Playstation 3 now in a much greater position in terms of hardware sales, the news is no real surprise. Amy Hennig also confirmed that DLC is on the way before 2009 is out. She confirmed, "We're working on that now ... there will be DLC available before the end of the year." Even more exciting was word that the DLC will include "new maps, new characters, things like that ... some of it will be free of charge and some of it will be purchasable." Free Uncharted 2 DLC? Awesome.